Edmonson County is a county located in the U.S. state of Kentucky. As of the 2010 census, the population was 12,161. Its county seat is Brownsville. The county was formed in 1825 and named for Captain John "Jack" Edmonson (1764–1813), who was killed at the Battle of Frenchtown during the War of 1812. The sale of alcohol is currently prohibited in Edmonson County. Edmonson County is included in the Bowling Green, KY Metropolitan Statistical Area. Edmonson County was established on January 12, 1825 from land given by Grayson, Hart and Warren counties. A courthouse built in 1873 replaced a former structure rendered unfit when its floor collapsed. According to the U.S. Census Bureau, the county has a total area of 308 square miles (800 km2), of which 303 square miles (780 km2) is land and 5.1 square miles (13 km2) (1.7%) is water. As of the census of 2000, there were 11,644 people, 4,648 households, and 3,462 families residing in the county. The population density was 38 per square mile (15 /km2). There were 6,104 housing units at an average density of 20 per square mile (7.7 /km2). The racial makeup of the county was 98.39% White, 0.58% Black or African American, 0.44% Native American, 0.07% Asian, 0.06% from other races, and 0.46% from two or more races. 0.56% of the population were Hispanic or Latino of any race. There were 4,648 households out of which 31.80% had children under the age of 18 living with them, 62.20% were married couples living together, 8.90% had a female householder with no husband present, and 25.50% were non-families. 22.40% of all households were made up of individuals and 9.60% had someone living alone who was 65 years of age or older. The average household size was 2.47 and the average family size was 2.88. In the county, the population was spread out with 23.60% under the age of 18, 9.00% from 18 to 24, 27.80% from 25 to 44, 25.30% from 45 to 64, and 14.40% who were 65 years of age or older. The median age was 38 years. For every 100 males there were 92.50 females. For every 100 males age 18 and over, there were 89.33 females. The median income for a household in the county was $25,413, and the median income for a family was $31,843. Males had a median income of $26,770 versus $17,158 for females. The per capita income for the county was $14,480. About 14.20% of families and 18.40% of the population were below the poverty line, including 25.50% of those under age 18 and 21.00% of those age 65 or over. There are currently four public schools operating as part of the Edmonson County School System. They are Kyrock Elementary (in the Kyrock community in northern Edmonson County), South Edmonson Elementary (near the Chalybeate community in southern Edmonson County), the Edmonson County Fifth/Sixth Grade Center and Edmonson County Middle/High School (both in Brownsville). There are two main routes that form the major transportation corridors through Edmonson County. KY 70 is the primary west to east route, traversing the width of the county. KY 259 enters Edmonson County at the border with Grayson County, near the town of Bee Spring. The highway continues on, bridging the Green River(the only bridge over the river in Edmonson County), before intersecting with KY 101. KY 259 then branches off in a southeastern direction while KY 101 continues as the main north-south route through the county, exiting into Warren County just south of the community of Chalybeate. 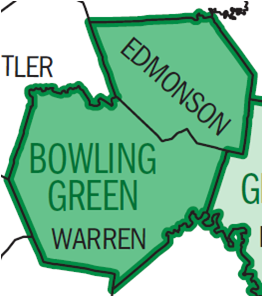 Additionally, KY 185 is a north-south route connecting Bowling Green with points in Grayson County and points north which lie between. I-65 passes through the southeastern tip of the county, but has no interchanges allowing access to the road. I-65 parallels the older US 31W, which runs through a small southeastern portion of the county. The biggest tourist attraction in Edmonson County is Mammoth Cave National Park, which usually draws almost 2 million visitors a year. The park includes in its area roughly a fourth of the county. Located mostly in the northern part of Edmonson County, the Nolin Lake area was incorporated as a Kentucky State Park in 2001 and offers fishing and other recreational opportunities. Edmonson County is served by a weekly newspaper, the Edmonson News. The paper is sometimes referred to by its nickname, "the Gimlet", and carries the slogan "It Bores In". The paper has a circulation number of 3,704. On March 6, 2007, MTV wrote an article titled "Who's Joining The Army" in which they stated Edmonson County has the highest Army enlistment rate of any county in the United States. The unincorporated community of Wingfield, in southwestern Edmonson County, is home to the transmitting tower of Antenna TV and MyNetworkTV affiliated low-powered television station WCZU-LD Channel 39, and adult hits-formatted radio station WKLX-FM 100.7 Sam FM. Additionally, Edmonson County is also served by an online news website, Edmonsonvoice.com. It serves as the main media outlet in the county with a weekly readership of over 12,000. The Edmonson County Police Department has been featured on A&E Television's "Live PD". Edmonson County Lions Club Fair - early September (including a parade that takes place in downtown Brownsville on the second Friday of September), one of the longest-running county fairs in the state. Nolin Fest (July or August) - at Nolin Lake State Park, organized by the Friends of Nolin Lake. Joe Blanton, Major League Baseball pitcher, was born in Nashville, Tennessee, but spent most of his childhood and young adult life in Edmonson County on Otter Gap Road. Ben Helson, a guitarist for Dierks Bentley, is a native of the Chalybeate community. ^ a b "State & County QuickFacts". United States Census Bureau. Archived from the original on July 9, 2011. https://www.webcitation.org/603eW2Raw?url=http://quickfacts.census.gov/qfd/states/21/21061.html. Retrieved March 6, 2014. ^ "Find a County". National Association of Counties. Archived from the original on 2012-07-12. https://www.webcitation.org/6962cjXgL?url=http://www.naco.org/Counties/Pages/FindACounty.aspx. Retrieved 2011-06-07. ^ "Edmonson County". The Kentucky Encyclopedia. 2000. http://www.kyenc.org/entry/e/EDMON02.html. Retrieved August 21, 2014. ^ Rennick, Robert M. (1987). Kentucky Place Names. University Press of Kentucky. pp. 89. https://books.google.com/books?id=3Lac2FUSj_oC&lpg=PA49&dq=cannon%20ky&pg=PA89#v=onepage&q=cannon%20ky&f=false. Retrieved 2013-04-28. ^ Gannett, Henry (1905). The Origin of Certain Place Names in the United States. Govt. Print. Off.. pp. 115. https://books.google.com/books?id=9V1IAAAAMAAJ&pg=PA115#v=onepage&q&f=false. ^ Hogan, Roseann Reinemuth (1992). Kentucky Ancestry: A Guide to Genealogical and Historical Research. Ancestry Publishing. pp. 225. https://books.google.com/books?id=hAVlVS29NKIC&lpg=PA193&dq=%22bell%20county%22%201914%201918%201976&pg=PA225#v=onepage&q=%22bell%20county%22%201914%201918%201976&f=false. Retrieved 26 July 2013. ^ "U.S. Decennial Census". United States Census Bureau. Archived from the original on May 12, 2015. https://www.webcitation.org/6YSasqtfX?url=http://www.census.gov/prod/www/decennial.html. Retrieved August 14, 2014. ^ Rabinowitz, Michelle (2007-03-06). "Who's Joining The Army? Lots Of Rural Kids - Election 2012 News". MTV. http://www.mtv.com/news/articles/1553971/20070306/id_0.jhtml. Retrieved 2012-02-07. This page uses content from the English language Wikipedia. The original content was at Edmonson County, Kentucky. The list of authors can be seen in the page history. As with this Familypedia wiki, the content of Wikipedia is available under the Creative Commons License.